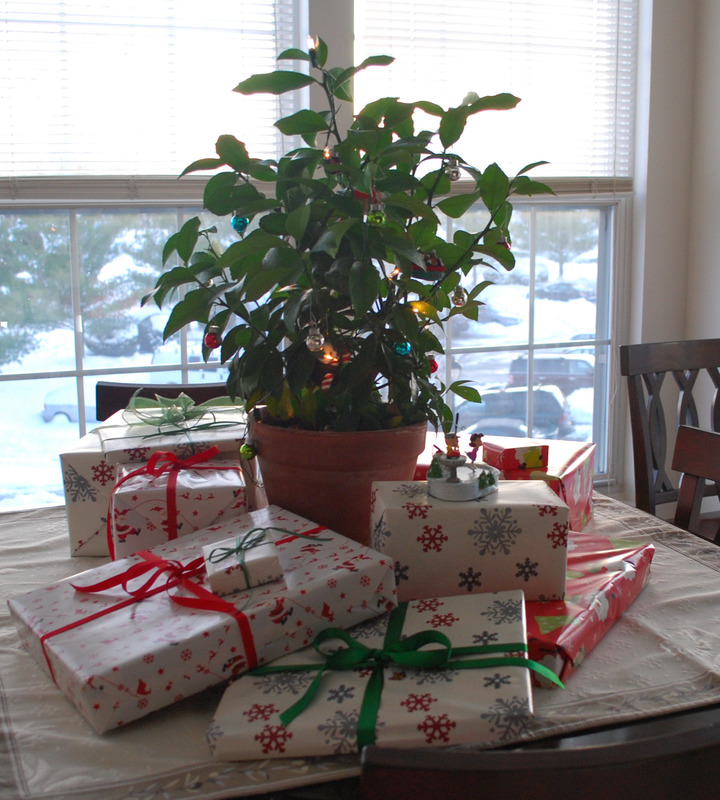 Our Christmas (lemon) tree – a holiday fixture in our dining room. The holiday season is now upon us and you may find yourself wondering what you should get for the female traveler in your life. I know shopping for your significant other can be challenging at times, especially when she doesn’t give you much of an idea of what she’d like or need. If you’re here reading this blog you have the biggest hint already, something travel related. I’ve searched top ten lists, travel retailers and the internet for some of the best ideas to please your favorite travel companion. No disclaimers needed here, these gift selections are my own finds. Control Laptop TSA-Friendly Messenger: A storage-rich laptop briefcase for your gadget habit. I am a firm believer that the ladies are always looking for a great bag. The folks at Timbuck2 can get you that bag and make it one-of-a-kind. You’ll not only get points for style but also for thoughtfulness. You just need to go through the website and choose the kind of bag, the size and choose the colors from the drop down menu, click through the accessories and put it in your online cart. You can spend less than 15 minutes on the purchase and the San Francisco-based company will ship the bag to you in two to four business days. The bag will be unique and she’ll show off quality construction to all of her friends. I have no doubt that your travel partner is a well-connected woman, and by connected I mean wired to the world wide web no matter where she is. That means charging accessories are a great gift idea. The chances of finding a place to charge your phone while on a plane is not likely and having switched your phone or tablet to airplane mode to read, watch a movie, or play a game is bound to drain your battery fast. So here are some battery backups to take with you to extend the life of your personal entertainment. The guys that make Samsonite luggage have a nice battery back up for under $50 that can charge devices with USB or micro USB. It’s also rechargeable itself through a DC input adapter. If you have an iOS device you can pick up the Mophie Juice Pack Reserve External Battery. The Mophie has a full charge for your iPhone or iPad and has a convenient hook to place it on your key chain so your traveling companion won’t have to spend precious moments before her device shuts down rooting through her cavernous purse. I also have some simple suggestions for those of you who want to pad the gift count, so it seems like you’re spoiling her, or if you need stocking stuffers. I suggest some custom luggage tags. A luggage tag is more than a something with your name on it to help your luggage find its way back to you if it gets lost, because you can always get that with the paper tag the check in desk gives you. A luggage tag can help you find your bag when it get to your destination because if you’re like most people you have the same black square piece of rolling luggage as everyone else. Avoid the scene where you force your way through the crowd to the luggage carousel and pull a bag as it goes by only to realize it’s not yours… and you put it back on the carousel and wait like an idiot. If you have the right kind of luggage tag you can spot your bag and only your bag as it comes around the conveyor How do you do that? You can use orange flagging tape like my family or get a customized luggage tag from the folks at Luggage Pros. You go through a simple four-step process uploading a personal message and photo and – boom – a tag that will set your black block apart from everything else on the carousel. A very small sample of the fun tags available through Flight001. Don’t want to fuss with designing your own tag? The guys over at Flight001 also have a great selection of tags and other gifts for the traveler in your life (including a vintage tag from a Tanzanian travel agency that might find its way onto our bags next year). My final suggestion can also be one of the most romantic: a map. I suggest the folks at MapEasy, they make colorful, fun maps of most major cities. A map can say “we’re going to go here one day” or “we’ve been here and I want to look at this map with you an remember all the places we’ve been together”. I hope this list can be helpful for the hard-to-buy-for partner, I know it’s given me some great ideas. I haven’t forgotten the guys, we’ll share the list to show your wives and girlfriends next week. I’m glad you liked it and thanks for the follow. We will be looking at the toys for boys next week.